Some consider abolitionist John Brown a madman, others a martyred hero. For decades, both northern states and southern states had threatened secession and dissolution of the Union over the question of where slavery was to be permitted. At issue was power. Both sides sought to limit the governing power of the other by maintaining a balance of membership in Congress. This meant ensuring that admission of a new state where slavery was outlawed was matched by a state permitting slavery. For example, at the same time that Missouri entered the Union as a slave state, Maine entered the Union as a free state. New states were organized into self-governing territories before they became states. Hence, they developed a position on the slavery issue well before their admission to the Union. Southerners held that slavery must be permitted in all territories. Northerners held that slavery must not be extended into new territories. 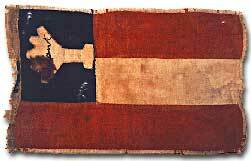 A border ruffian dropped this flag in Olathe, Kansas in 1862 after a raid on the town. If slavery were not permitted in the territories, slavery would never gain a foothold within them and southern power in Congress would gradually erode. If either side were successful in gaining a distinct advantage, many felt disunion and civil war would follow. 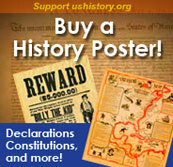 Kansas must be redeemed and saved, and we want a hand in helping on the good work. -Julia Louisa Lovejoy, abolitionist, sufferagette, and Kansas correspondent for several New England news organizations.